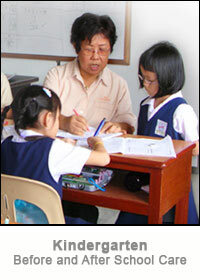 Before and After School Care caters to primary school children of ages 7 to 12. Our experienced, retired primary school teachers act as efficient and caring nannies by providing the children with proper baths and meals and in preparing them for school up to seeing them safely get up on the school bus. Being trained teachers, they are most capable of guiding the children in their homework and providing them with extra tuition when necessary. As a good friend, they lend an attentive ear to the problems faced by the children in school. They also share in the children's joy and achievements in school.